Green crabs have reportedly disrupted shellfish production in California, where the crab population continues to grow. On the East Coast, where the crabs are firmly established, they have damaged commercial shellfish operations, including harvests of soft-shell clams, blue mussels, manila clams, scallops, and hard-shell clams, according to studies. East Coast losses have been estimated at more than $22 million per year. 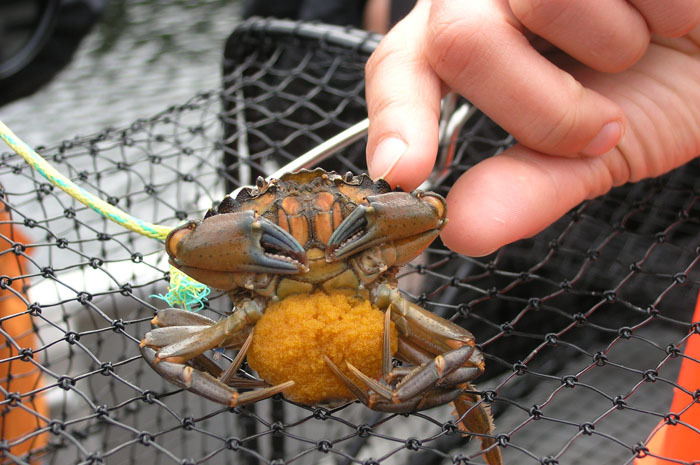 Green crabs are but one of the invasive species threatening Washington state, but they are getting special attention because of fears they could seriously affect the economy and ecosystem of Puget Sound. Besides devouring young native crabs and shellfish, they compete for food with a variety of species, including fish and birds. 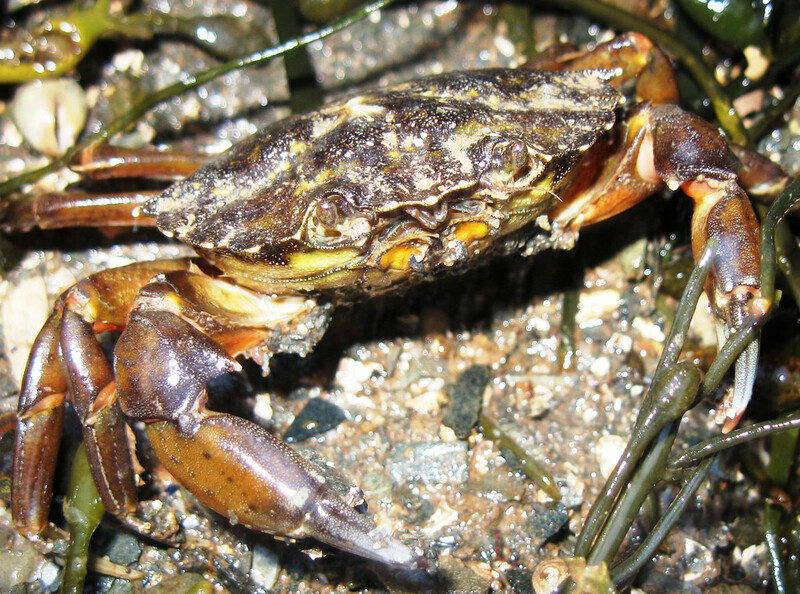 On the East Coast, Canadian researchers found that green crabs damage eelgrass beds while burrowing for food or shelter, thus limiting habitat for juvenile fish. Controlling the pathways of invasion is the idea behind Washington state’s rules requiring ships coming from California to exchange their ballast water at least 50 miles off the West Coast. Other programs, some adopted and some under consideration, are designed to limit invasive species brought in on ships’ hulls and in shipments of food, plants, live bait and aquarium fish. Although green crabs could have moved into California in ballast water, early investigations suggest that the crabs came to San Francisco in the 1950s or ‘60s with bait worms from Maine, where the crabs had become entrenched. The bait worms, prized by fishermen, were packed with seaweed inside little containers like those used for Chinese take-out, according to Andy Cohen of the Center for Research on Aquatic Bioinvasions in Richmond, Calif. The crabs hid in the seaweed, which fishermen often tossed into the water when the bait ran out. In the floating larval stage, the invasive crabs are known to survive in the ballast holds of ships, but that probably is not how they spread up the West Coast from California to Oregon, Washington and British Columbia. That invasion coincided with warm currents moving north during a powerful El Niño event in 1997 and ’98. In subsequent years, green crabs were identified in special traps placed in Willapa Bay and Grays Harbor on the Washington Coast, but the crab populations never took off. Now, the question is whether recent El Niño conditions may have seeded the region with more green crabs, perhaps introducing them into Puget Sound for the first time. Experts can’t help but worry that warmer waters in recent years could offer the invasive crabs a foothold for a population explosion. Teams of trained “citizen scientist volunteers” have been putting traps out each month to see if any green crabs show up in prime habitat, including salt marshes and shallow lagoons. That’s also favored habitat for the native hairy shore crab. In the search for green crabs, thousands of the native crabs are caught, identified and released by volunteers. They also survey changes in nearby habitat and search the beaches for empty carapaces, which are the shells left from molting. The volunteer program has operated under three sponsors since its inception in 1998, when the green crab was first seen on the coast. 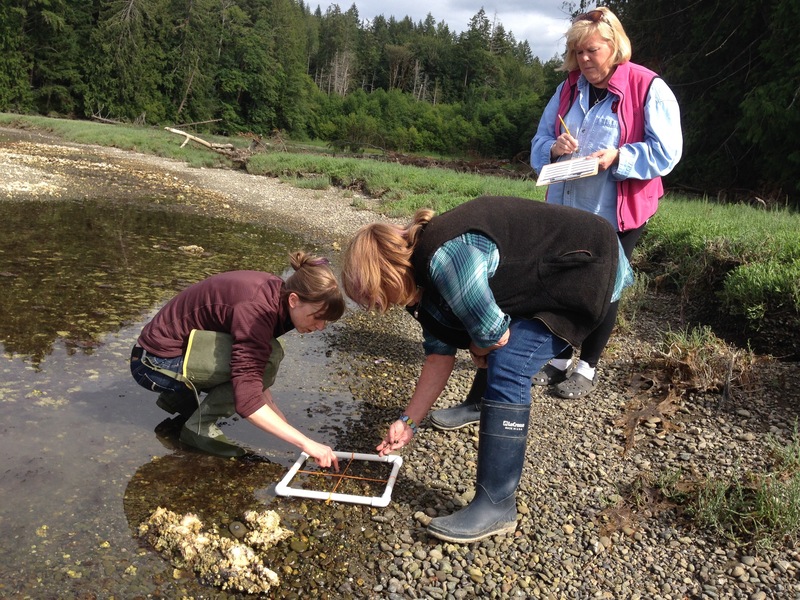 Beginning last year, the program in Puget Sound has been organized by Washington Sea Grant with funding from the EPA. Emily Grason, program coordinator, said if the green crab displaces the hairy shore crab or any species in Puget Sound, the repercussions through the ecosystem could be profound. But one should not make assumptions about what will happen, she said. Some studies suggest that native red rock crabs, common in rocky areas of Puget Sound, generally win in head-to-head battles against green crabs of equal or smaller size. That notion is supported by observers who say that when red rock crabs and green crabs are found in the same area, the native crab occupies preferred locations lower on the beach. If green crabs do show up in Puget Sound, an intensive trapping program would be launched in areas where crabs are caught, according to Allen Pleus, coordinator of the Aquatic Invasive Species Program at the Washington Department of Fish and Wildlife. If needed, he said, Alaska has agreed to make available its large stockpile of traps with the hope that the green crabs will not find a permanent home in Puget Sound.